Sure, people like to think debt collecting is all about breaking kneecaps, but it also involves paperwork and cash management. The former is especially important. Whenever Big Tommy’s collectors go to work, they have a vig list with number rankings that tell them what level of resistance to expect and what degree of pain the client wants meted out. Unfortunately, his rating system has been low-balling the former. Scott Adkins will take nearly as much as he dishes out during his first day on the job in Jesse V. Johnson’s The Debt Collector (trailer here), which releases today on DVD. French is a British expat, so he will get a lot of jokes about driving on the wrong side of the road. He is a skilled black belt, but his real deal MMA dojo is struggling. To pay the rent, he lands a gig collecting debts for Big Tommy through Mad Alex, one of his few students, who also happens to be connected. To learn the ropes, French goes out on rounds with the cynical, hard-drinking Sue (as in the Boy Named). Quite inconveniently, the tens that are supposed to be the easiest calls turn into fives and the fives turn into two’s or one’s. It is a heck of a first day, but none of it will trouble French’s conscience. Unlike what we’ve seen in previous movies, most of the people who borrowed from Big Tommy’s clients are low life grifters, who deserve a good beatdown. They also have plenty of hired muscle to take on French and Sue. Alas, French’s second day on the job will be something else entirely. 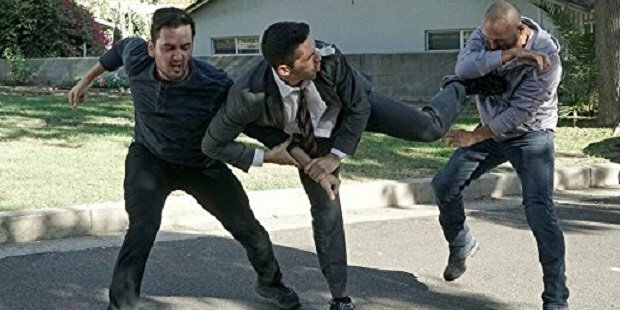 Although it gets strictly serious during the third act, the first two-thirds of Debt Collector qualify as a breezy, if bruising, action comedy, very much in the style of Johnson’s previous Adkins vehicle, Accident Man. Frankly, Adkins has never complained so much during a movie, but his character is sort of entitled to, all things considered. Adkins also forges some terrific bickering buddy chemistry with Louis Mandylor’s impossibly grizzled Sue. Vladimir Kulich is even steelier as Big Tommy, plus there are extended cameos for Tony Todd and Michael Paré. 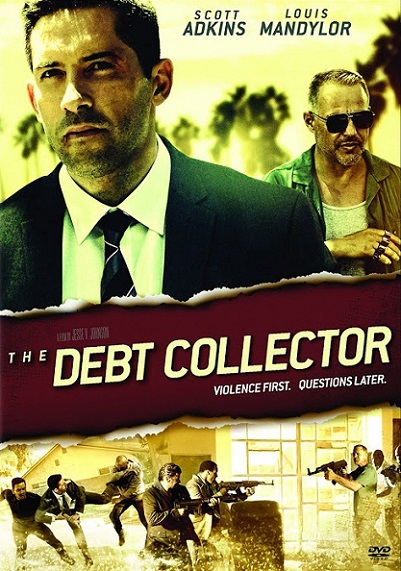 In terms of tone, Debt Collector is somewhat akin to an Elmore Leonard movie, but with less banter and more fighting. The screenplay co-written by Johnson and Stu Small will not exactly remind anyone of Noël Coward or Preston Sturges, but it clicks along nicely. First and foremost, it is a terrific showcase for Adkins’ chops. This is the film Once Upon a Time in Venice should have been. Recommended for fans of gritty, old school action throw-downs, The Debt Collector releases today on DVD.